I got into a conversation last night with my sister about spiritual growth & evolution. As I was explaining & diagramming ideas that I wanted to share with her about my perceptions of how we grow as human beings, I thought it could be helpful information to others on the path of personal growth. So, here I am to share it with you this morning. 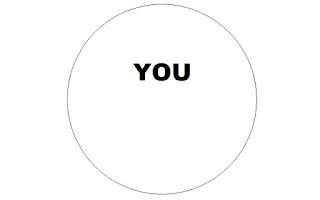 First imagine that this circle is you. Within it contains all of your body, your feelings, thoughts, emotions, your mind, your spirit, your experiences & interactions, your entire being. Everything that defines you as an individual. Your entire existence is in this circle. Now we will add in the reality of existing here in the earth duality. Above the line, we will label everything that is "Light". Imagine this area represents positive thoughts, love, joy, happiness, hope, faith, strength and everything that is good in the world. Below the line, we can envision everything that is "Dark". This will be all the challenges, the pain, the suffering, the setbacks, disappointments, frustrations, angers, etc. To live here on earth means that you exist in duality. You exist in a world of both good & bad, light & dark, positive & negative, male & female, etc etc. You carry within you aspects of both realms, a unique blend of each aspect, your own balance of Light & Dark. Consider now that it has been scientifically proven that you only utilize a small portion of your brain's capacity. Just as this is true, it is also true that people are generally only consciously aware of a small portion of their existence. So, of your entire being, you are most likely only aware of part of yourself. You probably think of yourself as a pretty good person. Making good decisions for yourself, trying to "do the right thing." If you have a negative experience, like someone expressing road rage, or your waitress treating you poorly, or your boss passing you over for a promotion, you would see that as something outside of yourself. It would seem that even though this is happening in your world, but it is not you. 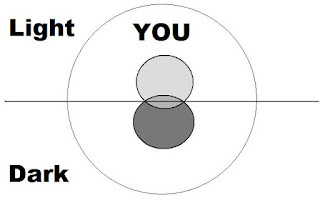 Your circle of conscious awareness could look like this. 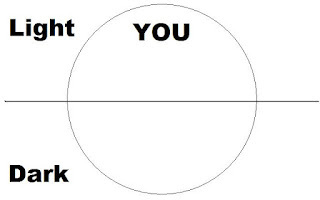 You would be aware of part of yourself, the part shown by the shaded circle. You may recognize your own behavior, but you probably fail to see how the things around you are part of you. You may see glorious gifts in another human being that you wish you had. You may see awful aspects in someone else that you don't want any part of. The reality is that everything in your world represents you. The truth is that you create EVERY experience that comes into your world to help yourself grow, but we will get into that later. For now, let's focus on the part of your world that you are aware of, the conscious aspect of your life. If you are alive & breathing, that means you are human. To be human is to experience all aspects of yourself. It is to understand your own internal balance of Light & Dark. We all have a "dark side" or a shadow self where our fears & insecurities lie. This is where you will find your hurts & your angers. It is represented by the darker circle below. You may not be very aware of your own shadows. Most people are not. 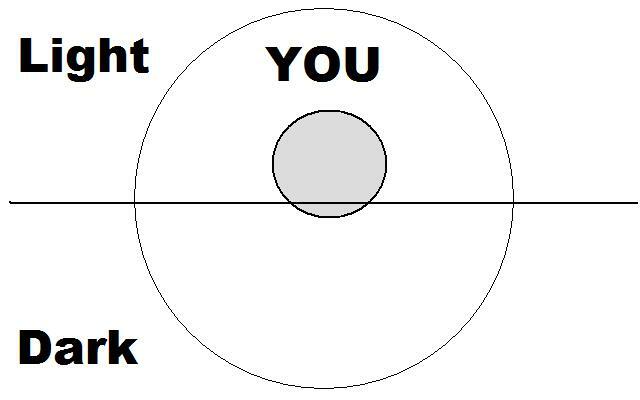 Most people are only aware of their conscious thoughts & their conscious life (the lightly shaded circle). If they've done any self-analysis, they may be somewhat aware of their weaknesses & strengths, but to really get to know your shadow self can be a frightening experience for most of us. 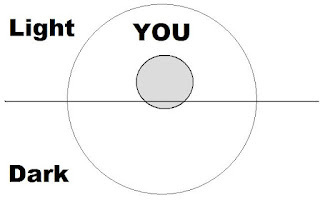 So, we stay focused on what we can cope with, which is a variation of the lightly shaded circle. People on the path of personal growth & spiritual evolution are looking for ways to explore their "stuff" and transform it, so their circles of conscious awareness may be larger than shown. People who cannot look at themselves or acknowledge their own issues, would have circles of awareness that would be significantly smaller. If someone comes into your world for any period of time, it is to either inspire you to see your own Light, or assist you in facing your shadows. It is very hard for many of us to look at our own faults, to BE with our own pain, so we externalize the negative. It is very hard for many of us to see our own glory, to experience our own divinity, so we externalize the positive. We look at those around us as separate from ourselves. We meet people who lift us up or people who knock us down (or any blended version of that mix). Whether that person is in your life for 2 minutes or 20 years, they are showing you areas within yourself that need healing. People come into your life all the time to either support you in finding your Light or to challenge you in exploring your shadows. Your lover may make you feel wonderful. Your parents may push your buttons. Your sister may give you emotional support. Your kids may drive you crazy. Your friends may hurt your feelings. You may fall in love with someone who seems to bring out the best in you... or the worst in you. All of these experiences are created in your life to help you explore yourself, your shadows & your light and to help you heal & you grow. It is important to remember that you are the WHOLE CIRCLE. Your awareness may only be part of the circle, but you are your whole world. You attract everything & everyone that you need to explore exactly who you are, both good & bad. You create every experience in your life. There are no accidents. Every judgement you make about someone outside of yourself is all about you. Every beautiful thing you see in others, is in you as well. Everything that you see as good or bad in the world, is all about what you see & accept (or reject) within yourself. You are the creator of your life experience. You manifest all situations to facilitate your own personal growth process. Much of that is done subconsciously or unconsciously, so sometimes it can feel outside of us, but it is always within. So how do we become aware of more of ourselves so we can prevent developing uncomfortable situations in our lives? For those people who are familiar with lucid dreaming, you know that the concept is that all of your subconscious fears & "darkness" reflect in your dreams and that by learning to navigate or control your dreams, you are taking charge of those subconscious fears & changing your life. The path of self-mastery exists with the same concepts of getting to know all aspects of yourself, the good & the ugly, accepting yourself for who you are & healing whatever imbalance exists within you. Simply by becoming more aware of yourself and of what you are attracting, you become more capable of using that "law of attraction" to create change in your life. You may now be looking at your life and wondering, "Ok, I've seen my own shadows, I've looked at my issues, but they are still friggin' chasing me. How do I overcome them or heal them?" The answer is more simple than you think. Love is the most powerful healing force in the Universe. By loving yourself, by loving others & by letting others love you, you are bringing forth the balance you need to achieve your healing. Love melts away fears. Love heals wounds. Love gives you strength. Romantic love is only part of that picture. Love can take many, many forms. Staying open to all of them allows you the ability to transform your shadows into brilliant & beautiful light, allowing you to live a brilliant & beautiful life.